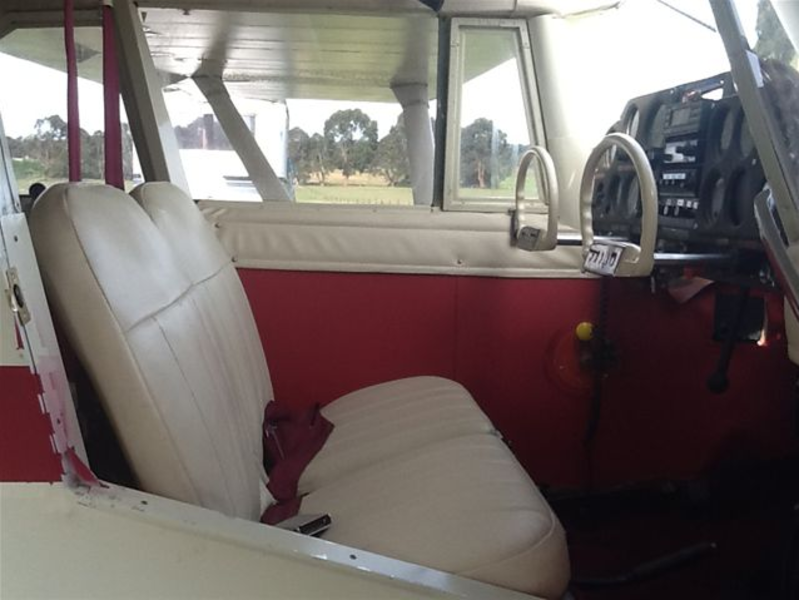 It’s time to fit out the cabin with instrument panel, seats and linings and to start I need to paint the internal areas that were painted on the full size. VH_RST was painted at Piper Aviation a combination of Cadillac Red and Daytona White. The interior was pretty typical of American cars of the late 50s early 60s in that it was two or more colours of leather, paint and plastic. I’m going to paint around the windows with gloss Daytona White and line the doors and side panels with Cadillac Red. The floor will be painted flat black, the seats red. 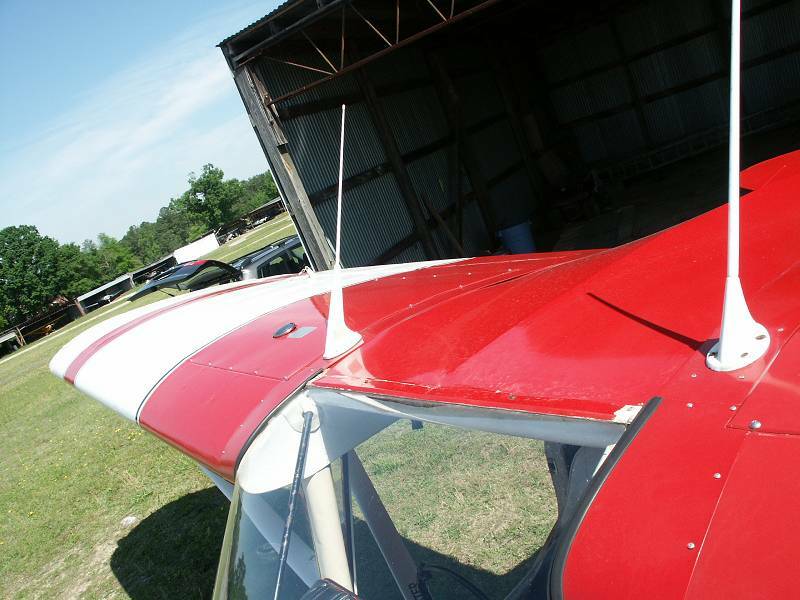 The lining panels were made from cardboard covered with Hobbyking Carmine heat shrink film. I made paper templates, cut the cardboard to size and then covered them. I’ll fit door handles and the trim wheel to them before I glue them to the doors and cabin sides after painting. I need to paint the inside of the cabin and the door frames before I fit the linings but I have to get all the wing wiring up to the top of the cabin where it will be plugged into the wings. I want to hide it as much as possible so I will need some ducting or framing to be done first. I had made up a panel for all the electronics to be mounted on and its now time to connect up all the wiring so I needed to know where the batteries were going to live. I lashed up a balancing beam and surprise, surprise the plane is nose heavy with the big Saito and the substantial nose wheel leg and wheel. The four LiPos will reside as far down the back as physically possible. I fitted both wings so I was able to set up the cabin top root ribs and glued the wiring with a bit of Zap Goo to the inside of the ribs, I then made some extra ribs and fitted them 10mm inside the root ribs. The wing wiring was located between both ribs with an exception around the wing mounting spar. I would have liked to drill a hole in the spar so I could hide the wiring but thought that might be a bit unwise!! All done with the first rough coat of Daytona White applied. Now that I’ve completed all the wiring and the internal painting I was able to glue the panels, door linings and instrument panel into place. The door handles are a pretty crude make up from aluminium tube and plywood after my total failure to master CAD. I had hoped to draw scale handles and then print them out on a 3D printer, next life maybe. Biggles has arrived so now I can get stuck in to seats and seat belts to finish off the cabin interior. I’m going to use XPS foam for the seats and it’s something I’ve never used before. It’s very rigid, you can sand it like wood but it still ends up looking porous so I’m going to have to use a filler somehow to get a finish to look like leather. The seat belts are 12mm wide twill binding painted grey and the buckles are made up from lithoplate. I think the seats were vinyl in the original but as I wasn't able to get a gloss finish on the foam seats I had made the seats in my plane are imitation velour. Now that the cabin is finished I was able to plank the roof and fit the spine which will give this Tri Pacer its peculiar hump backed look as per the full size below. 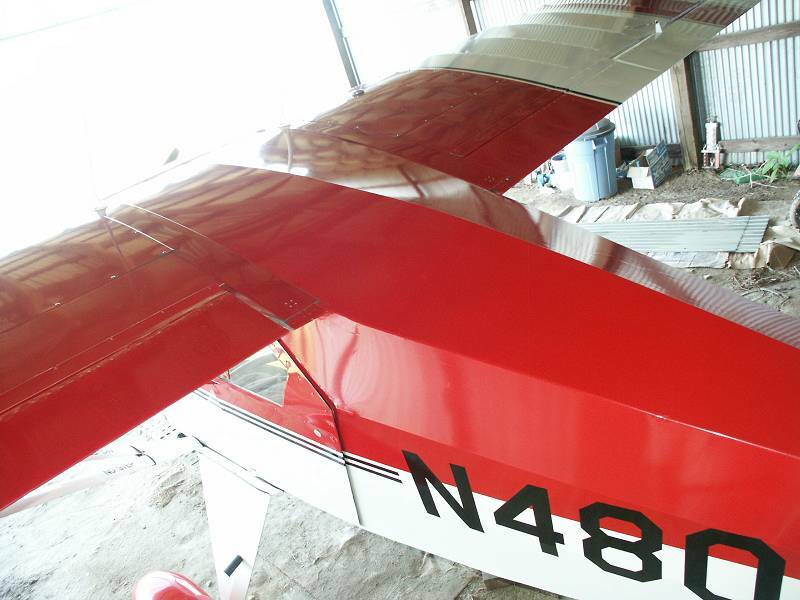 With the roof done the construction of the aeroplane is as good as finished with only the glazing to be done after fiberglassing and covering so I guess I’ve still got a bit less than 50% to go before we go flying. Next riveting instalment will be all about final cowl fitting, fiberglassing the front end and then covering the rest of the fuselage with Solartex.